Take the 1988 “blanc de chardonnay” vintage champagne from Pol Roger, which I pulled out from my cellar the other day, to welcome some great friends of mine to a pre-Christmas dinner. The bottle had been in the cellar for close to ten years, waiting for a special occasion. And celebrating this particular friendship seemed to fit the bill. The wine was still vibrant and almost as bubbly as a young sparkler, but with a nice golden colour brought by its almost twenty years of age. Acidity was still quite present, with a nice touch of bitterness on the finish, and the flavours and aromas were dominated by toasted bread, brioche and almonds. The mouthfeel was the most remarkable thing, though, with a velvety richness, yet tightly wound and dry. The 1988 vintage is deemed exceptional, with wines that have a lot of backbone and a bit of austerity. The Pol Roger fits the description, and could have gone on and on and on. You don’t even need to buy expensive vintage champagne to get the benefits of ageing. A friend of mine in France pulled out a non-vintage Mumm Cordon Rouge Brut from the 1970s, seven or eight years ago, and it was a wonderment of nutty aromas, rich texture and brioche flavors, with enough bubbles left to tickle the palate and taste buds. Quite a lot of fun. Which is certainly a great part of what champagne is about. The 1988, much enjoyed by all, and now left as memories. Notice how the older cork has kept a “straight mushroom” shape, instead of expaning as younger ones do when released from the pressure of the bottle neck. With this post, you’re encouraging me to buy a few bottles and throw them in the cellar! 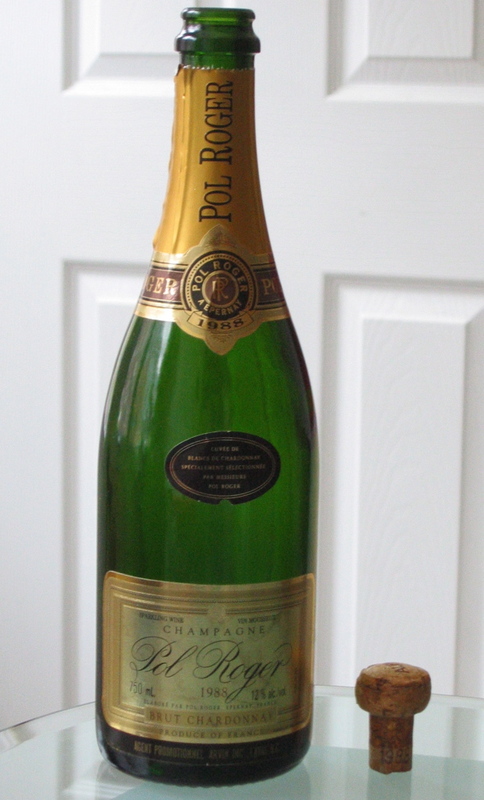 I have an 1988 pol roger too in my cellar. I want to know if your prepared the bottle befor serving it. No special preparation is needed. Just don’t over chill it. 8-10 degrees Celcius is a good serving temperature. If you serve it cooler, you won’t get to appreciate the flavors as much.